One and a half hours door to door by car from Nice Airport, a little longer from Genoa airport, La Casa Piccola comprises a double bed sitting room with separate hall, bathroom (bath and shower) and kitchen with washing machine. 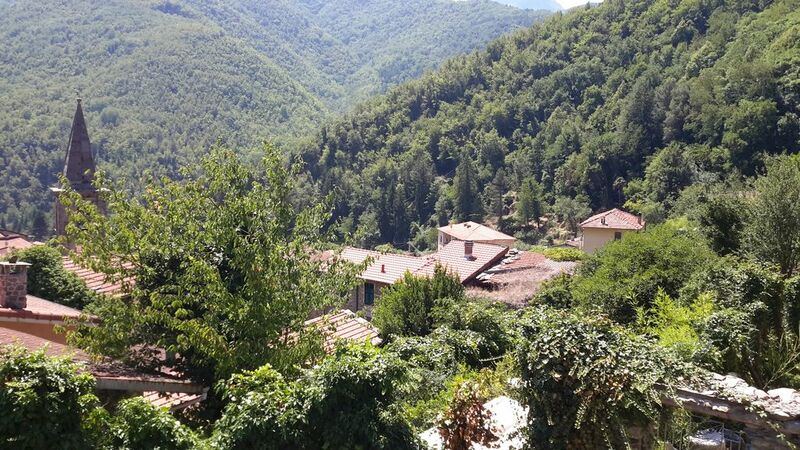 Stunning views from the sitting room and garden, 5 minutes walk to the local river fed community swimming lake and a beautiful 16 mile drive to Italian Riviera beaches makes La Casa Piccola an ideal holiday retreat. Overlooking the ancient mill town of Molini Di Triora, La Casa Piccola is a short walk through spectacular medieval streets to bars, restaurants, butcher, baker and traditional grocers shops. The area is excellent for walking and mountainbiking. Good internet access in almost all the local bars and cafès. For night life, San Remo, Menton and Monte Carlo are all within easy reach. Molini di Triora has a local bus service from Taggia or San Remo train stations, so access by rail is also possible. Please note, the property you will be staying in is an annexe to Via Case Soprane 30, it is about 30 metres from the house with its own entrance and small garden. Ann: Retired mathematics lecturer. Australian Nick: Retired broadcast engineer. English. Tranquility with no passing traffic. Sunny. Swimming lake less than 5 minutes walk. Fresh air, 3 bars, great restaurant in village and superb pizzeria in next village. Not suitable for guests with limited mobility (steep cobbled streets).